Memorial card of Dr. Cornelius J.O’Leary, Galway kept by Captain Daniel Dennehy, IRB, IV, Rathmore Kerry in his private collection. Cornelius was from the village of Costello in Connemara, Co. Galway. He attended University College Galway (U.C.G.) where he graduated in Arts. During the 1916 Easter Rising Cornelius (Con) O’Leary was arrested and placed aboard the HMS ‘Gloucester’ along with John Faller and Professor Steinberger both of U.C.G. The prisoners were tranfered to the HMS ‘Snowdrop‘ on route to Cobh, Co. Cork. From Cobh they were then placed aboard HMS ‘Albion’ and then transfered again to HMS ‘Adventure‘ which brought them to Dún Laoghaire. They were brought to Richmond Barracks and eventually imprisoned at Frongoch, Wales. After his release Cornelius joined the professorial staff at Stonyhurst College run by the Jesuits in Lancashire, England. He returned to Ireland and studied medcine at University College Dublin (U.C.D.). 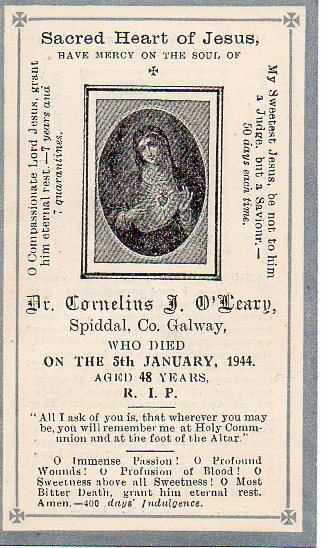 After a period of time back in England he returned to Co. Galway, Ireland where he was appointed Medical Officer of the Spiddeal Dispensary district in 1931. He died on 5th January 1944.